When Congress reconvenes next week after its August recess, there are a couple of things you can count on: impassioned debate on domestic and foreign policy, and Texans having major parts in those debates. From left: U.S. Rep. Jeb Hensarling, R-Dallas; U.S. Rep. Lloyd Doggett, D-Austin; U.S. Sen. John Cornyn, R-Texas; U.S. Rep. Bill Flores, R-Bryan; and U.S. Rep. Joe Barton, R-Ennis. WASHINGTON — One of the most chaotic and frenetic congressional sessions in recent times is expected to play out this fall. And thanks to the size and rank of Texas' delegation, the state is expected to play an outsized role in the drama. With the state's 38 delegation members, including the second-ranking Senate Republican and a presidential candidate, it should be easy to find a Texan in the middle of the action as debates emerge on abortion, a possible government shutdown and President Obama's controversial foreign policy. Texans also run five House committees and form sizable voting blocs in both parties. Here's a look at upcoming policy debates on Capitol Hill and how Texans could play key roles. One caveat: U.S. Senate Majority Whip John Cornyn is not listed in these categories because, as the top Republican vote counter in the Senate, he will probably be involved in nearly every piece of legislation. What is it? In July, President Obama and his foreign policy team agreed to a nuclear deal with Iran, which was immediately met with Republican revulsion. But the only way the GOP-controlled Congress can upend the agreement is to pass legislation against the deal and then subsequently override an inevitable Obama veto of that measure. On Wednesday, Obama secured enough Senate support to uphold a veto. There was some doubt that support among Senate Democrats would hold for Obama. House Minority Leader Nancy Pelosi, along with an assist from U.S. Rep. Lloyd Doggett, D-Austin, engaged in a lobbying effort to lock down Democratic support in her caucus. It became one of the toughest decisions that House Democrats have made in recent memory, with many expressing angst between alienating the president and the Jewish community, which has largely opposed the deal. As it stands, a handful of Texas Democrats announced support for the deal, but many are still publicly on the fence. When is it expected to come up? The Iran deal is expected to be the first major issue Congress addresses when it returns to Washington next week. What is it? The hottest topic on Capitol Hill in August was whether conservatives would tie defunding Planned Parenthood to a looming government funding deadline. If that is not resolved, a government shutdown could be imminent. Cruz has little leverage among his Senate colleagues, but he does hold sway over a restive band of House conservatives who created trouble for U.S. House Speaker John Boehner during the 2013 government shutdown. Flores is the chairman of the Republican Study Committee, the largest voting bloc of House Republicans, and he has the power to make life easy — or difficult — for House GOP leadership. When is it expected to come up? The government funding deadline is Sept. 30. What is it? A handful of Texans have spent the year making a concerted push to allow crude oil on the international market. 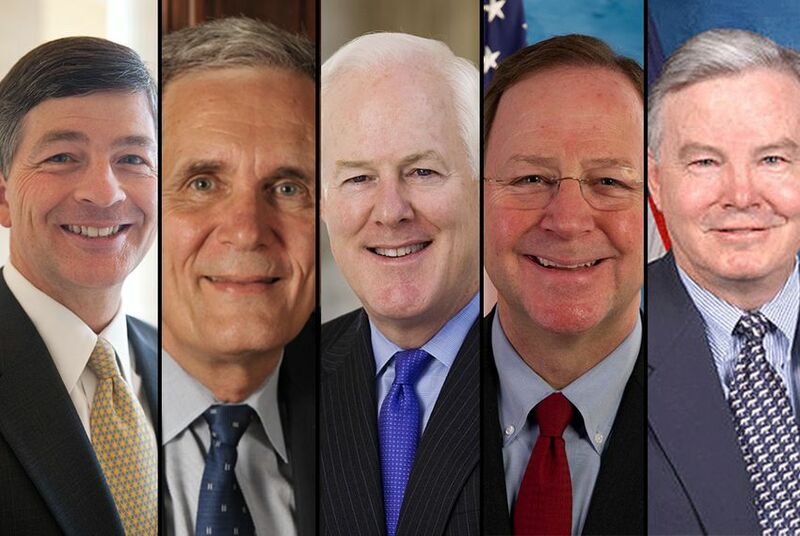 Key Texas Players: U.S. Reps. Joe Barton, R-Ennis, Henry Cuellar, D-Laredo, Gene Green, D-Houston and Michael McCaul, R-Austin. Barton and McCaul each drafted separate legislation on the issue this year, and Cuellar is a top Democratic advocate for the legislation. Green, however, is against the deal and sparred with Barton during a committee hearing over the ban. When is it expected to come up? A set timeline isn't clear, but Barton told the Tribune in a recent interview that his aim was to get legislation on the president’s desk by Christmas. What is it? Since Republicans took control of the U.S. House in 2011, there has been a recurring drama over whether the federal government will raise its borrowing limit. Many economists argue that a failure to raise the debt limit could result in economic cataclysm. But conservatives often argue that the debt ceiling is the best time to exact budget concessions from Obama. Key Texas Players: House Rules Committee members Pete Sessions (Chairman), R-Dallas, and Michael Burgess, R-Lewisville. Several Capitol Hill staffers believe that debate on the issue will not be as dramatic as past instances. The debt ceiling could be lumped into other pieces of legislation, but the center of the drama could be in the Rules Committee, chaired by Sessions, which controls what happens on the House floor. But, much like House Democrats on the Iran deal, every Republican vote will count in the debt ceiling tally — including those in the Texas delegation. When is it expected to come up? Late fall. What is it? The Export-Import Bank is a once-obscure government agency that has become a focal point of conflict between anti-establishment conservatives and mainstream Republicans. The agency's authorization lapsed this summer, and there is a heated battle to revive its charter. Key Texas Player: U.S. Rep. Jeb Hensarling, R-Dallas. There is no more forceful – and powerful – advocate to kill the Ex-Im Bank than Hensarling, the chairman of the House Financial Services Committee. But it’s also worth watching U.S. Rep. Joaquin Castro, D-San Antonio, who is positioned to lead a quiet pro-Ex-Im effort. When is it expected to come up? To be determined. The bank’s reauthorization could be attached to a must-pass bill at some point this fall. What is it? Congress was unable to pass a long-term funding bill for the Highway Trust Fund in July, so members are expected to try again. Key Texas Players: Republican House Ways and Means Committee members Kevin Brady of The Woodlands, Kenny Marchant of Coppell and Sam Johnson, R-Richardson. The legislation hit a major snag when it came to sorting out the funding. So keep an eye on the members of the powerful tax-writing committee to sort out how to pay for the measure. When is it expected to come up? Late October.